On May 11 and 12, the 3rd game of the 64th Meijin-sen between Meijin Moriuchi and Challenger Tanigawa 9dan was held in Kagawa prefecture. Before the game, the score was 2-0 led by Moriuchi. 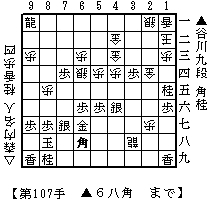 Tanigawa played Sente(Black, lower side) and won the game with 107 moves. I think it was another masterpiece of Tanigawa's lightning speed endgame. The diagram in the left is the resignation diagram when Tanigawa dropped his Bishop on 6h to intervene between his King and Moriuchi's promoted Rook. At the diagram, Meijin Moriuchi had a kNight, a Lance and 4 pawns in hand but had no quicker approach than Tanigawa did. The quickest approach to Sente's King would be N*7e to threat to capture the Gold on 6g. But it would be neglected and Sente would make a decisive kNight drop on 3e. Let's see the details after the resignation diagram. The 4th game will be held on May 18 and 19.